Very useful action. I often find myself running through the exact same series of steps repeatedly. One question: is it that there’s no way to automate a max size of 800 in either direction or that you prefer to deal with horizontal and vertical images separately? Great ! Um, is it just me and my Mac that I seem to have problems downloading the action? Even right click/save only downloads a /txt file? Thanks anyhow for the great contributions and Happy Holidays! The Image Processor script already does everything that this action does (and more). It’s available under File…Scripts, but more usefully you can use it in Bridge by selecting Tools…Photoshop…Image Processor (I think; I’m away from my computer right now). 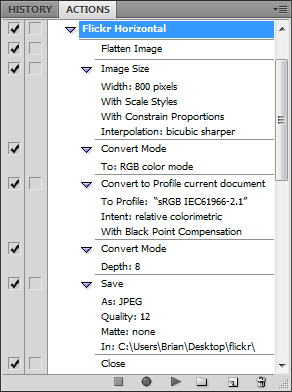 When you use it in Bridge, you can select a single file or a whole folder, and it will convert every file to the format and size that you select, covert them to sRGB if you want, and save them in a subfolder (JPEG, PSD, or TIFF) or a folder that you select. You can throw RAW, PSD, JPEG, and TIFF files at it, and it works just fine. I use Image Processor, which was originally written by Russell Brown, all the time whenever I’m generating a JPEG that needs to be resized. It’s invaluable. @John I haven’t found a way for it to be wrapped into one action — but somebody else out there might be able to enlighten us. @Amo I’m sorry to hear it’s not working for you — I really couldn’t tell you what the problem might be, I’m not a Mac. Anybody else on Mac? @BH Yup, that script does pretty much the same thing (and more). I guess the one thing about the action is that you don’t have to choose a destination folder each time you use it. The intent is to output to the same place every time for your most heavily used websites. But if you want to output to different folders all the time, the script is probably a better choice. Of course, if you have Lightroom…. LR will also batch save files to a common location AND you can set it to resize the “Long” end of the photo to 800px so orientation is irrelevant. Just set an Export preset, select all photos and go. Better yet, instead of creating JPEGs on disk that you’ll delete later, you can export them direct to Flickr or most other photo sites, or even FTP to a webspace and skip the delete step as well. Yes, once before I tried to download an action that was made with a PC – same thing. I guess it does not work on both types of systems. @Jason Yeah, yeah, yeah… Lightroom. One of these days I’ll probably start using it. The things you just noted are definitely awesome features. @Amo there’s got to be a way to get it to work. I wouldn’t think that the action file is specific to pc or mac. I’ll see what I can dig up on this topic. Yeah, yeah , yeah, Lightroom! Even better than Jason’s suggestion would be to head on over to Jeffrey Friedl’s Blog (http://www.regex.info/blog) and download one of his many export plugins that will do all of thies automatically, AND upload it to Flickr too. All in one step! He has plugins for many popular photosharing sites (Flickr, Picasa, SmugMug, Zenfolio), and Facebook too. This is definitely the way to go… One day you’ll come around!! I’ll probably be the last photographer on Earth to jump over to Lightroom. I’m almost convinced… but not quite yet. Maybe LR3 will do it for me. Too funny! The ice age is coming! Thanks so much! I hate to admit it…but I’ve just been uploading my full res photos to Flickr! So this will be very useful…and now people won’t be able to steal my stuff as easily! Thanks! AMO: I am on a Mac as well, running Leopard and PS CS4. had no problems with installing it. I right-clicked to Save As download, then pulled it in the PS Actions folder, restarted PS, then double-clicked to install. Works like a charm! Is it really necessary to jpeg at 12 for what is effectively a screen image? It makes for large file sizes and I suspect you could get right down to about 8 without noticing any quality loss on the screen. At 800px longest edge, noone is going to be maginifying or printing. Perhaps some experimentation with quality settings is in order. You’re right, 12 isn’t necessary. I usually save out to a 10 for the images I post on the blogs. Sometimes you can see the artifacts at 9, and usually at 8. Anything below that is definitely noticeable. I figure with my Flickr photos, why not go full quality? It’s not like I’m trying to optimize load times. And at 800px, the files to upload are still tiny. 1.You can process many pictures at once. 2. You can define a maximum file size. The software will save all images at that file size, each with the best image quality possible. This is very handy when you want to post the pictures to a website that has a file size limit and you want the best quality. 2. You can resize the picture and you won’t have problems with different orientations. Just leave one axis at “0″ and the programme will automatically detect if your picture is portrait or landscape. 3. You can apply a certain level of sharpening to all images. This is VERY useful because most pictures will look dull after you resize them. I miss this very important option in your action. 4. You can add a custom border (with many options) – only if you want to of course. The programme is a freeware programmed by a German programmer. Thus the download site is in German only. But don’t you worry: Just download the jpgcompressor.zip (link is on the right site of the website linked below). Then unpack the files into a folder and just run the exe – no need to install! Now everything is German… DON’T WORRY! In the upper right corner of the programme is a button called “Sprache umschalten”. Click that button to switch the language top English! Brian – Success! Thanks to Lynly, I tried one more time with my old Mac and old version of PS ….I right clicked to save and was sent a file called “Flickr Resizer.atn.txt”. I deleted the “.txt” appendage (Are you sure ? they ask – YES!) et voila! a true blue PS Action!! And this is definately one I’d like to tool around with! I realized that flickr was doing something weird to my photos, and liked it. Before I stumbled across this I didn’t even know about bicubic sharper resizing. Phew. Thanks!